Would you look at these?! ARE YOU LOOKING AT THAT?! 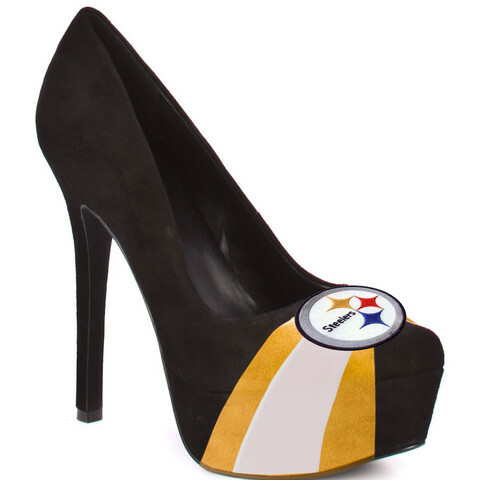 5 1/4-inch suede Steelers heels that are so popular you can only by them on pre-order for $100. 1. WHO ARE ALL THE WOMEN ORDERING THESE THINGS AND UNDER WHAT CIRCUMSTANCES WOULD YOU WEAR THEM AND NOT LOOK RIDICULOUS, AND IS JEFF REED INVOLVED IN ANY OF THEM?! 3. *I can’t walk in heels higher than four inches. In fact, four inches is when I start walking like my knees don’t work. 4 1/2 inches is when I start walking like a drunk platypus in 4 1/2-inch heels. I imagine 5 inches is when my back gives out, my knees lock, and then this would happen. That girl would totally rock those shoes to the fullest of their rocking potential. *There are so many “that’s what she said” jokes in there it’s not even funny. I can easily imagine some Black n Gold Groupie wearing these to the stadium in December. I could watch that model in the video do the newborn giraffe thing a thousand times and not get tired of it. I just watched it no less than 4 times and only turned it off because the timer on the stove went off :) The 2nd time is the best – she tried her DAMNDEST to stay upright! The video was HILARIOUS…thanks for sharing! The shoes…not so much! I assume the wearer of these shoes will be whipping shitties around a brass pole in McKees Rocks. Can’t wait to see the cross-dressers sportin’ em! Oh. My, (Look. Who’s). Back. Yep, I noticed him as well on another post a day or so ago. Hope the meds take this time. And here I thought Scott, with his generally optimistic and sunshiny attitude, was Bojack… I guess he (Scott) is just cranky. I thought the same thing, empirechick. Just goes to show, eh? I, too, immediately thought, “I rock my Hittsburgh gear to the fullest,” upon seeing these on Pinterest. Enjoying the clime and striped bass in eastern NC! No meds here my pretties! IF YOU WANT TO SEE ALL THE NFL TEAMS IN OUR COLLECTION? PLEASE EMAIL WEWANT@HERSTAR.COM TO SHOW YOUR SUPPORT IN EXPEDITING THE LICENSE. I would totally wear those and I’m not a stripper, nor do I find Jeff Reed (or his behavior) attractive. In fact, I saw the Packers ones on Pinterest and I wondered if these were available. I wouldn’t wear them to a game, though. That’s just silly. And I certainly woudn’t pay $100 for them. Bravo, ladies! Wear those sky-high heels! Nothing says “HAWT” like hammertoe! Eh-hem…Uh…(raises hand slowly)…I would wear them.